On 27 August 1549, the popular East Anglian insurgency known as 'Kett's Rebellion' was defeated in a bloody confrontation with loyalist forces at the valley of Dussindale, just outside Norwich, England. Despite the battle's significance, and its vital implications for the study of mid-16th-century warfare, its exact site has yet to be determined conclusively, hampering attempts to analyse the conflict further and to record its location accurately for archaeological and heritage purposes. 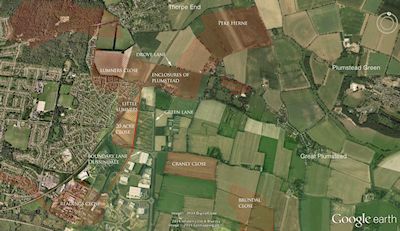 This article will demonstrate how geographical information systems can be utilised alongside historic maps and written sources to identify the 1549 battlefield within the modern landscape. To do this, it will employ methodologies of map regression, similar to those used at Towton (1461), Bosworth (1485), and Edgehill (1642), as a means of testing and advancing the findings of Anne Carter, who in 1984 suggested the most credible theory regarding the engagement's location. With the help of these tools, the article will not only ascertain where the battle took place, but will also reconstruct its historic terrain, fulfilling an essential requirement for considering its tactical aspects. By doing so, it will demonstrate the ways in which digital technologies can be applied to broaden and support traditional research.